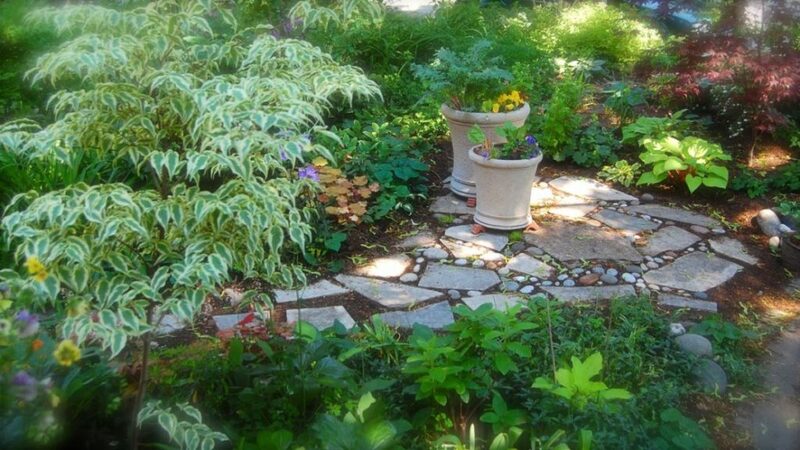 A couple of years ago, I embarked on a garden project I called my Grand Simplification. My goal was to make my gardening life less complicated by rethinking the space. Simple is hard, as any designer will tell you. While the process is nowhere near finished, this is my progress report. You can see my “before” picture here. The paving stones here cover what was left of my tiny lawn, which in the shade of Norway maples always looked straggly and was always a chore to edge more than to mow. Gone. We simply covered the last of it with newspapers, topped with the pavers that once edged the beds, and added mulch. More than choosing plants that will work in my dry shade garden, this means grouping plants needing similar care together, placed for easy access. So the few iffier plants, such as the rust coloured heucheras and chartreuse hostas, are at the front of the beds around the stonework so they’re close enough to be babied, if required. Hardier plants are situated further away. My garden was always been my laboratory. I often tried one of something to see how it will grow in the toughest of conditions: dry sandy soil under the shade of Norway maples. But it gave a complex bittiness to the garden. Reformed. Or in recovery. Unless it’s a massive plant, never fewer than three. I now have a large beds of Epimedium rubra and Helleborus and am working on expanding others. Foliage is now my colour workhorse in the garden. The ‘Bloodgood’ Japanese maple was the first addition, and it has inspired other choices such as red epimediums. The blue ‘Tokudama’ hosta had been a success, so I’ve added blue ‘Elegans’ hostas. It has a larger form, with a more corrugated leaf and is said to hold up in dry shade. Golden foliage and, this year, some rusty reds are complements. In progress. Mulch, naturally. This year the addition of duck compost makes my sandy soil look chocolatey rich and acts as both a mulch and a fertilizer. 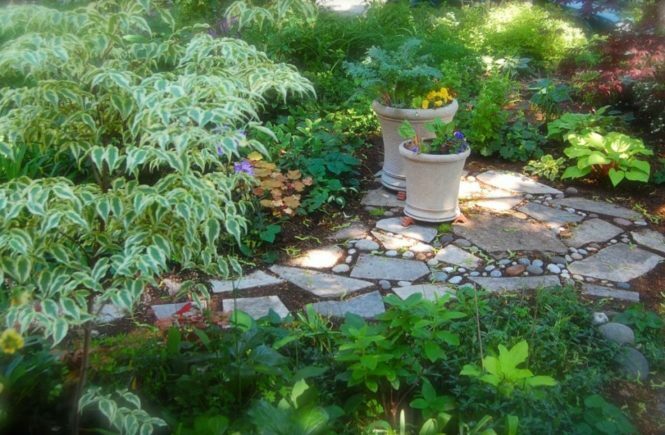 I’m cultivating groundcovers, such as the epimedium. And, of course, the stone. The goal is to keep weeds – and weeding – at bay and to conserve moisture. Done. I hope. I have a bed that I'm trying to simplify as well. It's so hard! But mine is sunny. Epimedium and Hellebore are my favorite perennials for dry shade. I love your little patio that replaced the grass. Henry David Thoreau: "Simplify, simplify, simplify." Bob Newhart: "Wouldn't it have been simpler to only say it once?" Your garden is lovely. I look forward to seeing it through all the seasons. Since the death of a tree, my partial shade garden will be full sun. Oh boy dunno what to put there now. Will be going thru books for sure. 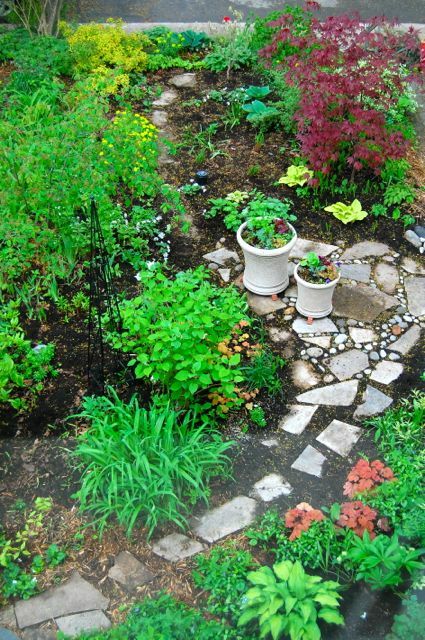 What is your strategy for keeping the weeds down between your walkway and patio pavers and stones? I spend more time attacking weeds in my garden walk and I it annoys me to no end. It has to be done to keep the garden neat, but I'd rather be gardening in the real sense of the word.